Need a quick and easy dinner idea? Try making this Chicken Pot Pie Soup recipe. Use refrigerated pie crust to make the crust on top, saves time and tastes delicious! I’m always looking for easy dinner recipe ideas. I bought a package of Pillsbury pie crusts and had every intention of making some individual pot pies. 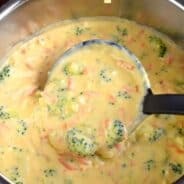 But then my kids requested broccoli cheese soup. So I thought, what if I combined the two? Chicken Pot Pies are the ultimate comfort food. 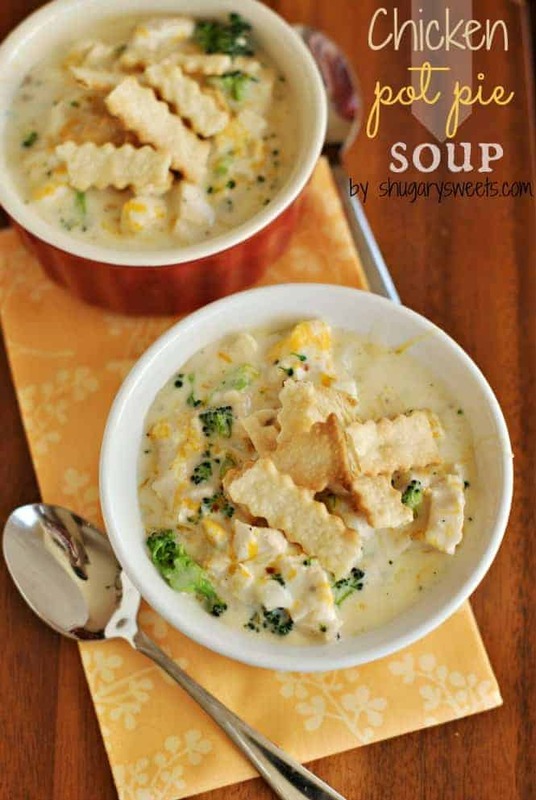 Today’s soup is loaded with chicken, broccoli, onion, celery and cheese. You can change it up by using YOUR favorite vegetables. Add potatoes, frozen peas, and carrots for a more classic pot pie. Substitute leftover turkey for the chicken, and nobody will be the wiser. I’ve also got a Beef Pot Pie Soup recipe on the blog if you think you want to try that version. It’s a little less creamy, and a lot more like a stew! To make life easier, whenever I cook chicken for dinner, I always bake up a few extra plain chicken breast. I stick them in a ziploc freezer bag and put them in the freezer to save for a quick dinner fix. If you don’t have any cooked chicken on hand, you can bake a couple breasts, grill them, boil them or go even more simple by using a Rotisserie chicken. Another option would be to put a few pounds of chicken breasts with one cup of chicken broth in the slow cooker. Cook on low for 6 hours. When done, shred chicken and use immediately in recipes or divide in ziploc freezer bags for future meals. This is something I tend to do on the weekends when we’re just relaxing at home. First, cook your chicken. You can use my examples above, or grab a rotisserie chicken for a fast cook idea! Next, add butter in a skillet with onion, celery and broccoli over medium high heat. This makes your house smell amazing. I love the smell of onions cooking, is that strange? Add some flour to thicken, then add your broth, cream, milk, chicken and seasonings. Simmer for about 10-15 minutes until heated thoroughly. While your soup is cooking, prepare the pie crust by cutting it into strips (I used a fancy pastry cutter, but a pizza wheel works too). 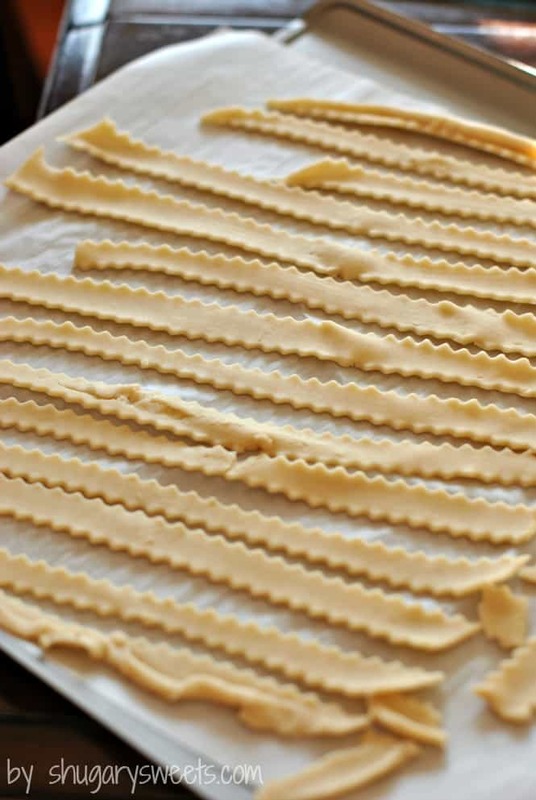 Bake pie crust strips in a 450 degree oven for about 6-8 minutes, until browned. 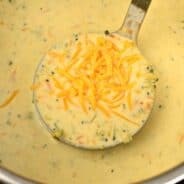 Once your soup has thickened, add in the shredded cheese and heat until melted. Serve with pie crust dippers. This delicious soup takes about 30 minutes, yet tastes like you’ve been cooking all day! Want to lighten this up? Take away the heavy cream and substitute with fat free milk. You may want to add in an extra tablespoon of flour to help this soup thicken up. Another way to cut calories would be to remove the cheese and pie crust dippers. I know. Those pie crust dippers are one of the best parts. But if you don’t make them, you won’t miss them. Dutch Oven. A good dutch oven is always a great kitchen staple. Perfect for cooking roasts and soups! Baking Sheet for making pie crust dippers in oven. This White Chicken Chili has all the flavor of comfort food, without all the fat! Enjoy a bowl for dinner tonight!! Need a quick and easy dinner idea? 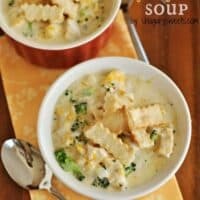 Try making some Chicken Pot Pie Soup. Use Pillsbury Pie Crust to make the crust on top, saves time and tastes delicious! To make crust strips, unroll thawed pie crust (for one crust). Cut into strips and lay on parchment paper lined baking sheet. Bake in a 450 degree oven for 6-8 minutes, until browned. Remove from oven. To assemble, Pour soup into individual ramekins and top with shredded cheese and pieces of pie crust strips. ENJOY! I saw this on Pinterest but didn’t realize it was yours until I looked at the pin closer haha Sounds so yummy! I’ll have to remember to save leftover cooked chicken to make this. Thanks Carla! Definitely keep this recipe in mind! That looks fantastic! I know my family will love this recipe. You used the crusts on the top – you’re a genius!! LOVE this Aimee! This looks super delicious right now. I bet the kids would love it, they are on a broccoli kick right now! Broccoli makes everything better! Mine slurped it all up, veggie and chicken chunks too! Using the pie crust is a genius idea. This looks like real comfort food! Yep, that’s me, a genius 🙂 I’m so pie crust challenged that Pillsbury works just fine for my needs!! What an absolutely brilliant soup! LOVE it! Talk about comforting! What a great way to get two of my favorite foods into one dish! Yep! I do it all the time, keep extras in my freezer for recipes like this one! thanks for stopping by! I’ve actually never in my life eaten a chicken pot pie. I don’t think that’s normal. This soup looks so much better than any pie has ever looked, though! Honestly, I have eaten MANY pot pies in my life, and it is better than most taste! This sounds delicious! I just wish it wasn’t so warm out or I would make it now! I will keep this in mind for when we have chilly days! It sounds like a wonderful idea and a delicious and comforting dinner. Love it Aimee!! Love the pie crust strips! I’d love a big bowl of this to eat while I watch the predicted snow fall tonight! I heart chicken pot pie so I know I would love a huge bowl on this rainy day! And using store bought pie crust is really the only way I can get crust to turn out!!! Love the tip to freeze the extra chicken. I do that with whole chickens all the time. I love the little crust sticks on top! So cute and great presentation. I seriously would LOVE a bowl of this right now. This is such a great idea! Love the bites of pie crust all over the top. I would eat this up! Love the twist you did on this dish! It looks so divine! Pinning! That little ziploc bag trick is brilliant, I love time savers like that 🙂 Chicken pot pie is the ultimate comfort food for me, I’d love to try this soup! Love this, Aimee! My pot pie lovin’ son would go nuts for this! OMG. My husband is going to go nuts for this. He lives for pot pie, and loves soup…so, this combination only makes sense! And I’m totally down with the Pillsbury crusts. It’s I the only way I roll! My husband is going LOVE this! Chicken pot pie is a favorite of his and I never make it. Too time consuming, especially during the week. I’m not a home made pastry for dinner person. Thirty minutes, I can handle! Thanks, Aimee! 30 minutes is totally worth the effort on this soup. ENJOY! 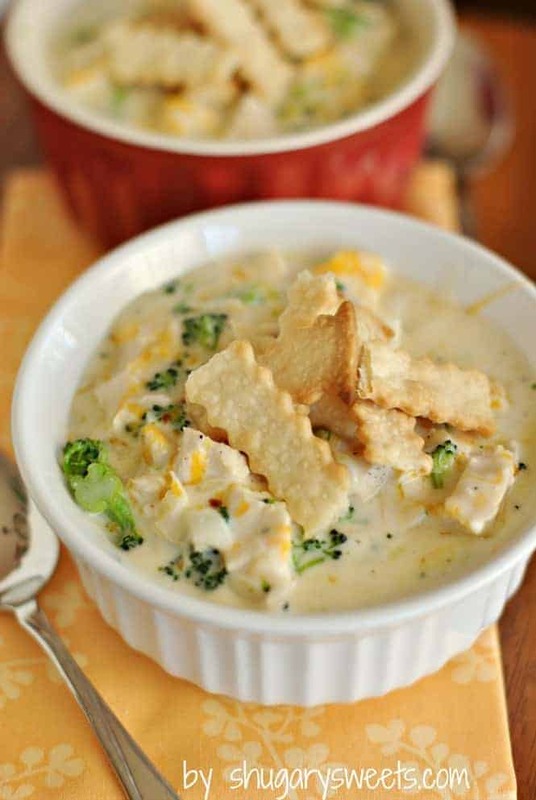 I love that you used fresh broccoli, I bet it gives a nice crunch to the soup. Sounds delicious! This is such a great idea, Aimee! Love the flavors. Fantastic! I want that for lunch today! I’m eating this right now, and it is GOOD. Yeah!! So glad you are enjoying the soup!!! Hi this soup looks amazing. I was just wondering, does it reheat well the next day, say for leftovers? It does taste great the next day! 1 cup of heavy cream and then you choose to use skim milk….seriously?!! Never in a million years did I think I’d see a recipe for “Chicken Pot Pie” in the middle of July… fabulous! I like that you made it into a soup, too. Had to share! I should also add that my boys have never been fans of chicken pot pie, but no leftovers with this recipe. Thank you! I made this soup tonight, just adding carrots and a bit more broth. It may be my favorite soup ever. Delicious! This might be a dumb question but how do you cook the chicken? Boil, bake, grill? Absolutely divine!! We loved it! However I think 6 servings is stretching it. We got 4 servings and had a salad on the side. Definitely adding this to my regular repertoire of recipes! Do you think this would hold up well in a crockpot?? I agree w/ a previous poster-6 servings was not possible. I had to add 1 c each more milk & broth to serve my family of 5. Luckily it thickened up enough even though I didn’t add more flour/butter. Would love to try this recipe but I’m lactose intolerant :/ I figured I could substitute the skim milk with soy milk, do you have any suggestions for a cream substitute though? I got this recipe from a friend and made it for dinner tonight. It’s so easy and very tasty and filling! As others mentioned I did feel that it needed more broth so I ended up using a 14oz can of chicken broth rather than 3/4 cup and 2 cups of milk rather than 1 cup. It thickened fine and the seasonings didn’t need adjusting either. I did add about 3/4 cup chopped carrots (a nice addition!) and I added more broccoli than the recipe called for so that may have thrown things off or maybe we just prefer a brothier soup. Either way, very easy to rectify 🙂 My husband really liked the cheese and pie crust “sprinkles”. I’ll definitely be making this again! Thanks! Instead of broccoli, I used frozen peas and carrots. Delicious! I did that too!!! Was delicious!!! I made this tonight with left over Christmas turkey, and it was a big hit. Love the pie crust strips, thanks! It’s one of my favorites, so glad you enjoyed it too!! Do you think it would work if I increased the broth and cream in lew of the milk? I made this tonight and it was so yummy! I will definitely be making it again. Thanks! GREAT to hear! It reminds me I want to add it to our menu again! Could this recipe be adapted for the crockpot? I also made this tonight and it was so yummy and satisfying on a cold day! I added carrots. I especially like the convenience for left-overs. Instead of storying part of a pie (that would get soggy), the soup can be refrigerated and reheated and served with pie strips that I stored separately to keep crisp! Thanks! It’s definitely a family pleaser 🙂 So glad you enjoyed the soup! Could you add carrots and peas to this recipe? This a keeper recipe that I want to try. My husband asked if I could add other veggies. So I never comment on recipes. Like this is the first time ever. But I had to because I have made this about five times and have felt like I died and went to heaven each time. My husband, who is quite possibly the pickiest man I have ever met, practically begs for me to make it. Thank you so much for sharing this recipe! It is absolutely delicious! I made this last night except I put it all in the crock-pot (adding cream at the end), added carrots, and omitted the flour and butter (I added a bit of cornstarch) and it was phenomenal! I bet it’s delicious, even better, following the recipe, but I am prego and get tired at the end of the day so I use my crock-pot whenever possible! How well do leftovers hold up with this recipe? I made this for dinner and seriously by the time dinner gets here I don’t think we will have anything more to eat. It’s soooooo good. I’d like it to have a little more soup part… So I may add some more milk.. It’s been sitting ready for hours so it’s a little thick but the flavor is unbelievable!!! Haha, so glad to hear you enjoyed the soup. Hopefully there was enough left to share!! Made this without heavy cream and we really liked it a lot and saved a bit of calories. Thanks for the recipe! Very nice. I added some cauliflower with the broccoli. Would cut the chicken into smaller pieces or shred then add next time. 9/10. This would make a lovely filling for pies if liquid was thick enough. I did add an extra ¼ cup of stock to our soup as it was quite thick when cooked. Would definitely make again. Thanks for a great recipe! Why does most of the recipes call for Kosher Salt? I never have Kosher Salt in the house. 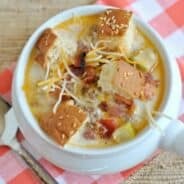 Your soups are delicious and simple to make. You do a great job. Thanks. Kosher salt is all I buy. I love the course texture, and flavor! You don’t have to add as much to the recipe as you would table salt. How many bowls will this make? Just made this and it was amazing! Love recipes like this one…quick and easy to make with delicious results! Made this tonight because my daughter just got braces and we’re eating a lot of soft food. We all loved it! Thanks for the recipe. This soup has the best flavor! It tastes just like a chicken pot pie! Thanks for sharing this recipe. I make it all the time! Winter is here and it is soup season! I am adding this to my recipe box. This is my kind of soup! Delicious! Totally saving this! This soup is so perfect when you just want something warm, hearty and comforting. Yum! I love soup and I love chicken pot pie! What a great recipe! Hi this soup looks amazing.!! Can’t wait to try it. This soup always gets rave reviews in our house. It’s delicious!